Not much snow is falling in the West. What a grim snowpack means for Nevada's water supply. A photo overlooking Washoe Lake taken from the Mt. Rose Ski Area on Jan. 1 at about 8,000 feet. Photo courtesy of Dan McEvoy at DRI. A year after record winter storms boosted water supplies in Northern Nevada and the Colorado River, which provides Las Vegas with most of its water, officials are watching the weather take a sharp turn in the opposite direction. Snowpack in critical basins for Nevada is far lower than the historical norms, with few storms on the horizon. 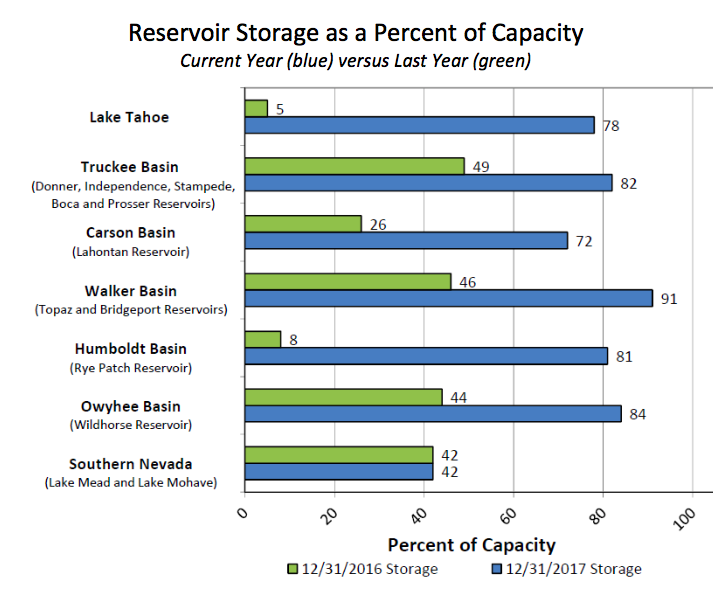 Nevada water experts cautioned that it was still too early in the season to draw conclusions but acknowledged that it would be hard to climb out of the early-season deficit. So the obvious question is: What does it mean for water supply? The answer varies and is largely dependent on what you do and where you live. The short answer might seem counterintuitive: despite a poor start to the snow season, Nevada is in a relatively good place in terms of short-term supply. Because of record hydrology last year, there is enough stored water to make it through a dry 2018. Across the region, many reservoirs are starting 2018 at a higher elevation than their starting point in 2017, following years of drought. In the long-term, the results are more varied. If the trend continues and there is little snowfall this year, it could stress brewing issues in several critical basins. If 2018 is followed by another dry year, it could place even more stress on the water supply. Another variable affecting this is a warming trend that has changed how snow disperses and integrates with the water supply. In the West, many experts describe the mountain snowpack as a big bank. It banks water as snow during the winter. As temperatures rise in the spring, mountain snow melts and flows into streams, eventually providing an annual water source for sprawling cities and rural farms alike. 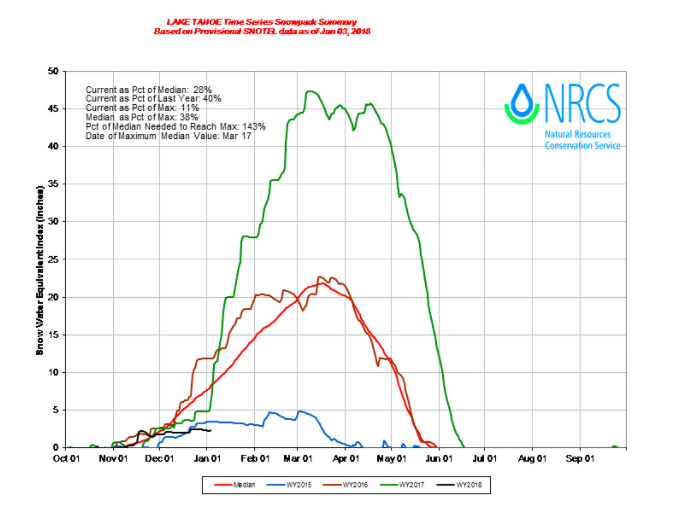 So how poor is the snowpack so far? With a few exceptions, the snowpack is lower than the median across much of the West. The following map displays the snow water equivalent, a measurement of snowpack as of Jan. 3. All of the red areas show areas where the snowpack is lower than 50 percent of the normal. Here’s what this looks like for areas important to Nevada’s water supply. Lake Tahoe: The graph below, from the Natural Resources Conservation Service, shows that snowpack around Lake Tahoe is about 30 percent of the average, represented by the black line. 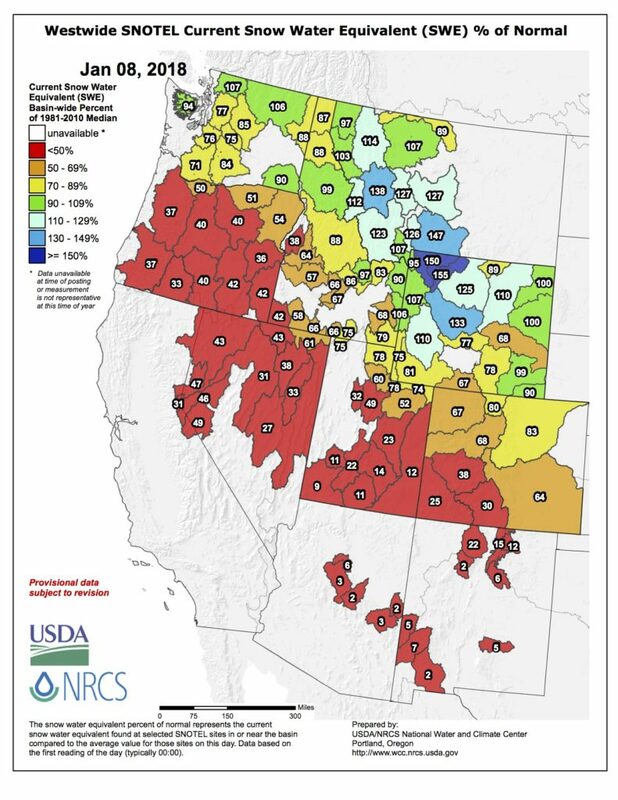 Upper Humboldt: Similarly, the snowpack in the eastern Great Basin that provides streamflow for the expansive Humboldt River (a key supply for agriculture and mining), is around 30 percent of the median. This is lower than the snowpack in 2015, a drought year in which the Humboldt River ran dry, spurring a contentious (and ongoing) issue over surface and groundwater rights. 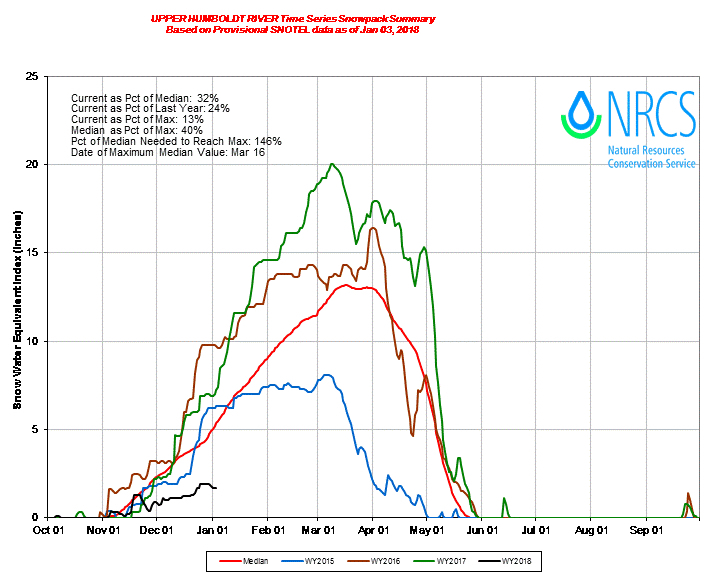 The Lower Humboldt River Basin is also below normal at 32 percent, near an all-time minimum. Colorado River Basin: For the Las Vegas Valley, important snowpack measures are recorded hundreds of miles away. Las Vegas gets almost all of its water from the Colorado River, which is fed by snowmelt in the Rocky Mountains. The results there are similar — a lackluster start. In this graph, the most recent season is represented by the dark blue line. The important caveat is it is only January. It is possible that several record storms could alter these trends, but the chances of reaching a median peak by April are slim. As an example, Anderson said there is a 3 out of 10 chance of that happening in the Sierra basins this year. “It’s going to be very difficult to climb out of this deficit since we’re so far down already,” said Dan McEvoy, a climatologist at the Desert Research Institute and Western Regional Climate Center. Does this affect water supply? It doesn’t in the short-term. At least not in Nevada. In fact, across Nevada, the state’s water supply is in a better situation than it was in 2017. As Anderson’s water report notes “the best water news in 2018 is the water stored from 2017.” Heavy rain and snowfall last year translate into a buffer even if 2018 ends up being a dry year. The situation with the Colorado River is more complicated but the result is the same. A forecast from the National Weather Service estimates that runoff into Lake Powell will come in at around 54 percent of average. This means less water going into an already beleaguered Colorado River system. But in 2018, it does not mean less water going from Lake Powell to Lake Mead and in turn, to Las Vegas. Like other reservoirs, Lake Powell is relatively full and under the federal guidelines governing the river, it is expected to release the same amount of water as usual. Then there’s the specter of the d-word. 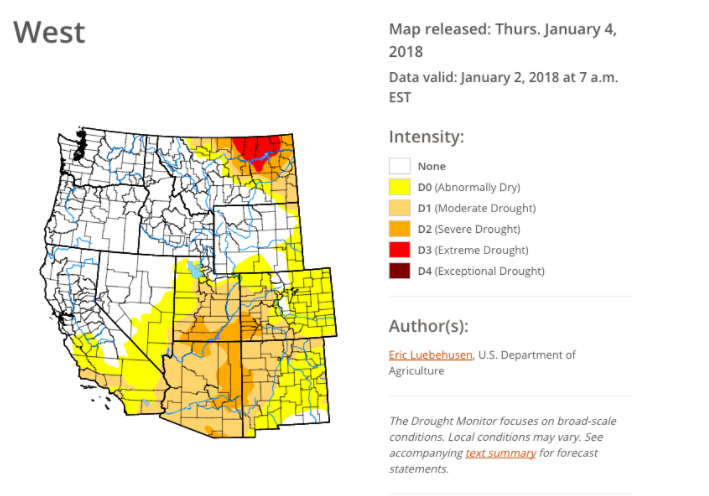 With little precipitation this season, several counties in eastern and southern Nevada are facing abnormally dry or moderate drought conditions, according to the U.S. Drought Monitor. Because reservoirs stored water from last year, water users should be able to get through a dry summer. In the long-term, a bad 2018 could bring more stress to already stressed water systems and erase the reprieve water managers got last year, especially if it is followed by more dry years. 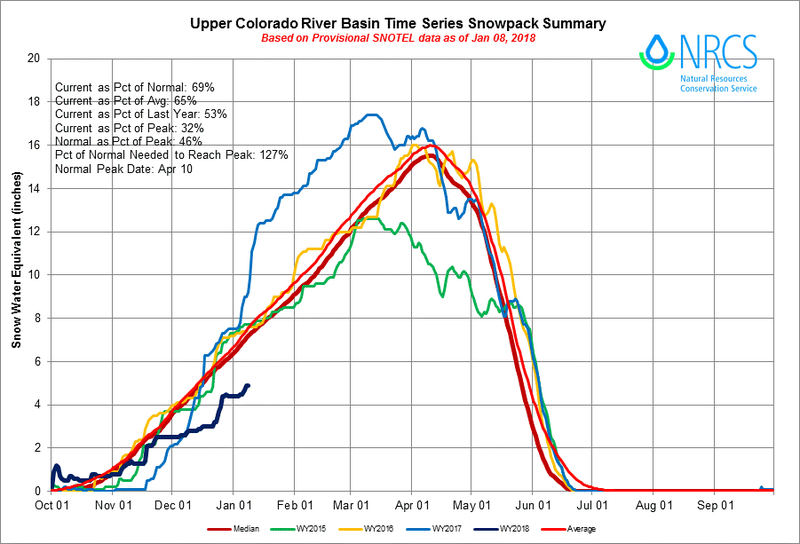 A poor snowpack in the Rockies, for instance, could push the river closer to shortage, where lower basin states would take voluntary cuts in their supply to keep more water in Lake Mead. “This increases the risk of shortage in 2019 and beyond,” said John Fleck, a professor at the University of New Mexico who studies the Colorado River system and western water issues. Likewise, a poor snowpack in central Nevada, especially if it continues for several years, could put more strain on Humboldt River users, who pursued litigation over river rights in 2015. But new concerns over drought could add pressure on groups arguing over water regulations. States that rely on Lake Mead — Arizona, California and Nevada — are negotiating a drought contingency plan. After last year’s good hydrology, there was less pressure to complete a plan. 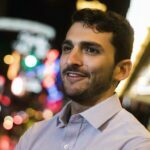 While the parties agree on a framework it has been held up by issues in Arizona and California. On top of all this is another variable driven by climate change. 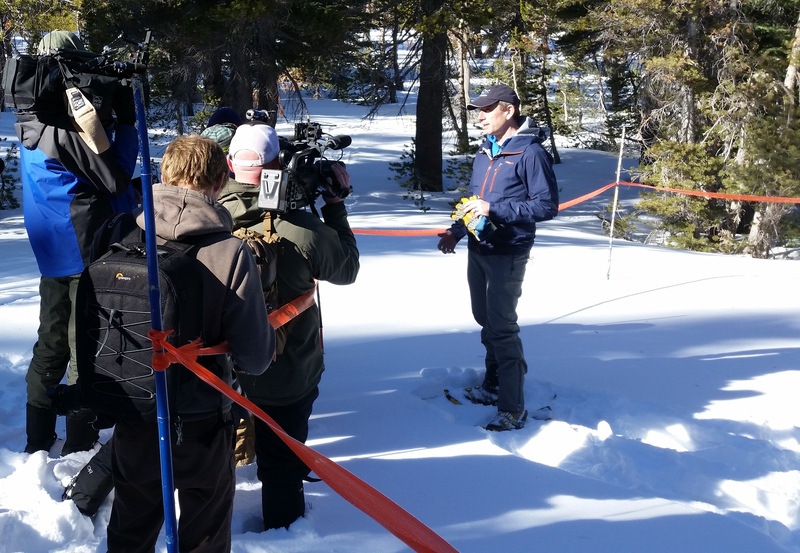 In recent years — wet and dry years — climatologists and water managers have observed a change in how the snowpack is dispersed in Nevada. Most of the snow is falling at a higher elevation, above 8,000 feet. Underneath that elevation, much of the precipitation falls as rain instead of snow. This is a common characteristic of having warmer storms, McEvoy said. As a result, less water is stored as snow for the spring melt and makes runoff more unpredictable. “It creates big challenges for reservoir managers and potential flooding problems,” he said. The same phenomena has been occuring with Colorado River runoff. Recent studies have found that earlier snowmelt and increased temperatures are reducing river supplies. The good news is that water usage among the Lake Mead states is decreasing. According to federal data, water use in 2017 was the lowest it has been since the early 90s, Fleck said.